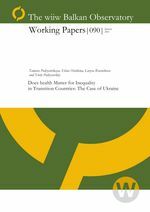 Significant deterioration in health and income inequality in Ukraine as well as in other CIS countries during the early transition motivated us to investigate the relationship between the two categories. Based on both macro- and micro-data analysis we focused on how different aspects of health affect income inequality in Ukraine. Significant impact of health has been proven on both micro- and macro levels. According to macrolevel results, a 1% increase in life expectancy leads to a 2,1% decrease in income inequality as measured by index Gini. Micro-level research also evidenced significance of different health aspects for income inequality.